Alicia Blanco-Bayo, tutor in Early Years Education at Edge Hill University will soon be spending 10 days in Jordan to support a community of refugees in collaboration with a charity called Collateral Repair Project. Women refugees can be especially vulnerable. Marking Women’s Day, fundraising, education and dance events are taking place to support work for displaced women. Can you donate a coat to keep a refugee warm this winter? Over 3,000 refugees are currently sleeping rough in Northern France, and temperatures are rapidly dropping. Some as young as 13, with no access to clean clothes, water or shelter. So this holiday season our goal is to provide each and every one of these refugees with a warm winter coat. To do this we URGENTLY need your help. 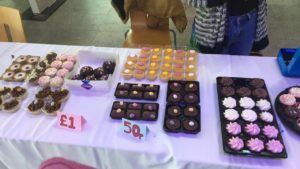 Global Unity held a cake sale to raise funds for Care4Calais, a charity supporting refugees who are living on the streets following the destruction of ‘the Jungle’.